First of all, let’s start out on the right foot here with a brief explanation of geotagging, in case you’re new to the subject. Geotagging is the act of adding geographical information (in the form of metadata) to some type of media, including photos, videos, websites, etc. How do people use geotagging? Geotagged photos are used any time people want to associate an image with a location. For example, say you want to document your vacation to Hawaii. You can geotag your photos and view them on a map of the island that displays exactly where each photo was taken. Or say that you’re big-time into fishing. You can take geotagged photos of each catch to document when and where you had the most success. An image of the Grand Canyon in Google Earth. 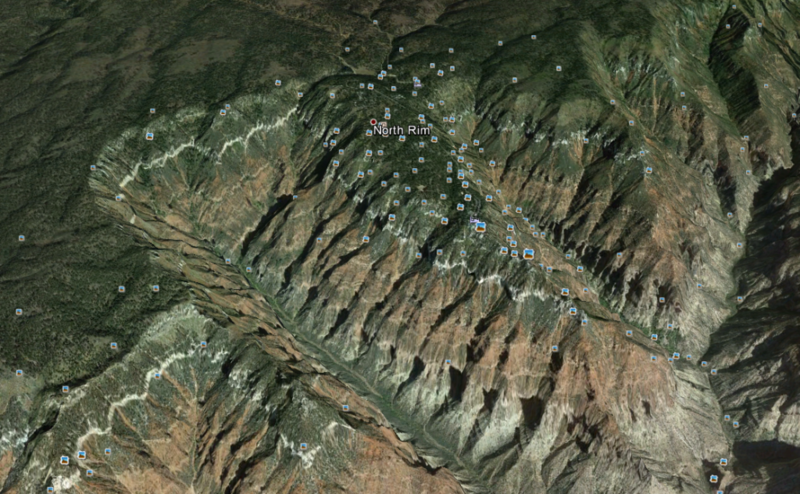 Check out all those geotagged photos! You’ve probably seen geotagged photos on Google Earth, where individuals can upload their photos for anyone to see. It’s a nifty way to catch a glimpse of places all over the world, or to find some sites you’d like to visit. All you need to geotag your own photos is a camera with access to GPS, which, conveniently, most smart phones have these days. How is geotagging used in data collection? In field data collection, geotagging is used mainly for two purposes. One purpose is to document an asset or a sample (for research). For example, Public Works professionals will geotag an asset, such as a fire hydrant, to record the date, time, and location and will then use software like Juniper Aspect to record details describing the state of the asset. Then the next time that asset needs to be inspected or maintained, its location and its previous condition can easily be recalled. The second purpose of geotagging in data collection is to provide what we call “GPS verification”—or proof that work on an asset was indeed performed. This is especially used when field workers are paid by the number of assets they perform work on, or when a contracted company needs to verify that they completed the work they billed for. The Mesa Geo model can be used to geotag your photos with date, time, and GPS location. To get started geotagging, watch this video featuring John, our product manager, as he walks you through a few easy steps. In the comments below, share with us how you’ve used geotagging before! I just purchased a Mesa-2. How do I geotag the photos with the gps coordinates? I can right click the photo and the coordinates will show in the Info that comes up. But I cannot figure out how the embed that info on the photo.